From start to finish, the team from David J Berry carry out work of the highest standards. 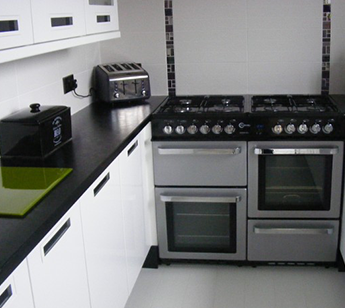 From plastering and plumbing to tiling and electrical solutions, we design and install new kitchens of the finest quality. Situated in Kirkcaldy, Fife, our professionals excel in intricate plumbing work and installations to bring you complete peace of mind. Removing your existing fittings and installing new ply flooring and plaster walling if required, we effortlessly fit a new kitchen of your choice. All electrical and plumbing work is carried out with the utmost care to guarantee that your new kitchen or bathroom is fully functional. We also paint and redecorate to ensure that the most recent addition to your home looks its best. Your input is important to us and we work hard to put a smile on your face, so if you wish to browse through some of our brochures, please contact us today. As a dependable team of professionals, we are on hand to offer honest advice and practical solutions for your home whenever you are ready to begin the payment process. Cheques, cash, and bank transfers are all accepted for your convenience. Contact us in Kirkcaldy, Fife, to find out more about new kitchens and plumbing work from our business.